The responsibility for Spiritual healing is dependent on the ability of the healer, who in Native American culture is a Medicine Man or Shaman, rather than person being healed and is sometimes referred to as Native American Medicine or Mysteries. The spiritual healing undertaken by the Shaman or Medicine Man is based on the shamanic healing practices and beliefs of Native American Indians and combines elements of spirituality, ceremonies, rituals and Trance States and Herbal Medicinal Plants to heal people. 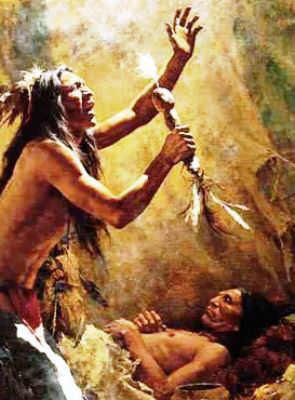 Native American Spiritual healing is part of a belief system that incorporates different elements of Animism, Totemism, Shamanism, Fetishism and Ritualism. The Shaman is believed to have a spiritual connection with animals, supernatural creatures and all elements of nature and possesses the ability to undertake spiritual healing. The Shaman is responsible for restoring well-being and harmony with the spirits of nature and the Great Spirit, or the Great Mystery, using his knowledge of shamanic and spiritual healing. The Native Americans believe that the supernatural spirit world is the abode of good and bad spirits. The good spirits help men and the bad spirits are able to harm men. It is the bad spirits that caused suffering, sickness and disease. When a man became ill it was believed that a bad spirit had entered his body and taken his soul away. Native Indians therefore believe that sickness stems from spiritual problems and that the Shaman possesses the powers of spiritual healing to disarm bad spirits and heal and protect their owners. The spiritual healing practised by the Shaman is focussed on the restoration of a person to return his being to a healthy and pure state by the actions taken during Shamanic healing and various ceremonies and rituals. Various rituals were undertaken that involved Shamanic and spiritual healing. One of the most famous Native American rituals is the Vision Quest that is also known as a form of a Spiritual journey and undertaken as a rite of passage or to protect men from evil spirits and succeed in spiritual healing. The role of the Shaman in such a ritual was of an opponent to the bad spirits and the guardian of the ordinary man. This form of Spiritual Healing was sometimes accompanied by the inducement of a Trance State for the purpose of attaining guidance or healing knowledge from supernatural spirits. A Guardian spirit in the form of a Power Animal is usually manifested as a literal vision or an intuitive revelation, sometimes triggered by just a thought. The less powerful plant Spirit Helpers, might also present themselves on this quest for Spiritual Healing. These tutelary spirits, are believed to empower and protect them from harm, like guardian spirits or angels. The tutelary spirit lends the Shaman with the wisdom of its kind, acting as a teacher to help him use his Shamanic healing powers. 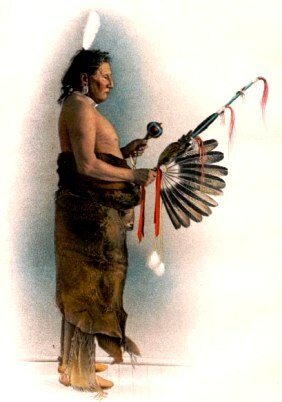 The Native American Shaman also uses other rituals and techniques when undertaking spiritual healing. The most important requirement of spiritual healing is the well being of the spirit. If the spirit is broken or lost, there is no help for the mind and body until the spirit is restored. Various procedures were used to purify and cleanse the body. 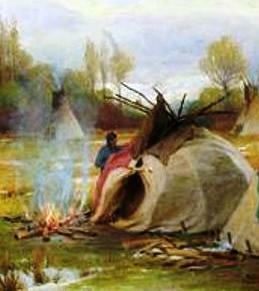 This practice took place in a Sweat Lodge and was often accompanied by practice called Smudging. The smudging procedure involves cleansing a place or person with the smoke of sacred plants and can be used to bring about an altered state of consciousness in the form of a trance state making a person more open to the healing techniques and the role of the Shaman invoking the healing powers of spirits. The Native American Shaman had an extensive knowledge of herbs enabling them to combine their skills as herbalists with the rituals associated with Shamanic and spiritual healing. Native American healing involves the use of herbal remedies which are given to the patients with due ceremony and accompanied by traditional spiritual healing rituals. This powerful combination enables the Shaman to undertake spiritual healing and treat the whole person, which includes attending the spiritual, mental, emotional, and physical needs of the patient. Native American Indians treat herbs with great respect and pray to the spirit of the plant to release their powers of healing and give a prayer of gratitude before picking them. The herbal remedies included herbal teas made from the roots and leaves of plants, ointments and salves and used in conjunction with other Shamanic and spiritual healing techniques. Spiritual Healing. Discover the vast selection of pictures which relate to the History and Culture of Native Americans. The pictures show the clothing, War Paint, weapons and decorations of various Native Indian tribes that can be used as a really useful educational history resource for kids and children of all ages. We have included pictures and videos to accompany the main topic of this section - Spiritual Healing. The videos enable fast access to the images, paintings and pictures together with information and many historical facts. All of the articles and pages can be accessed via the Native Indian Tribes Index - a great educational resource for kids.